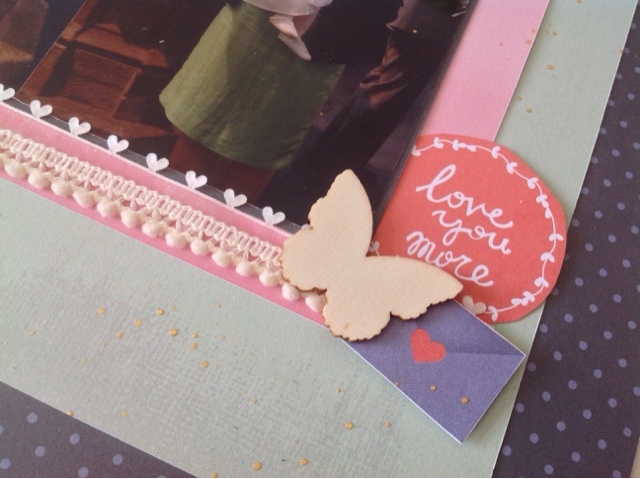 The second layout I scrapped for NSD weekend was for a challenge on Shimelle's website. The challenge was to use lace and/or trim. This gave me the perfect opportunity to rummage through my untidy ribbon box. I found some sheer trim with hearts and the last of some of my favourite Pom Pom trim and scrapped these photos from Boo's Christening two (I can't believe it was two) years ago. I used both the trims to make as held for my photos to sit on. 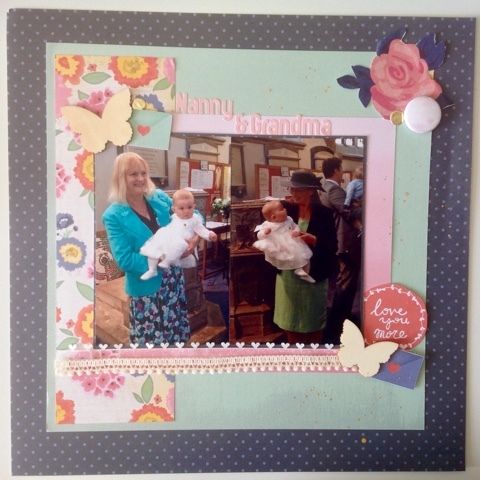 The papers I used are from Dear Lizzy Lucky Charm, I chose papers with colours which matched the outfits in the photos. I also fussy cut. Rose from a paper from Maggie Holmes Flea Market thinking I might use more of them but decided against it although the rose I did cut came in handy to cover a balloon design which was printed on the paper!